Wizards gain a +2 class bonus to Intelligence or Wisdom, as long as it isn’t the same ability you increase with your +2 racial bonus. Possible backgrounds include: magical prodigy, spell thief, hedge wizard, transformed familiar, ship’s wizard, royal poisoner. At 1st level, a wizard usually has a dagger, a robe or two, a wand, ritual components in pouches, and other minor accouterments suggested by their backgrounds. Wizards may start with either 25 gp or 1d6 x 10 gp. 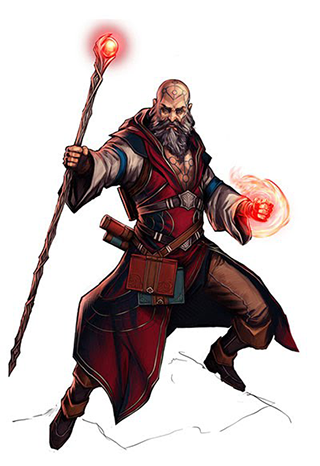 Wizards have four class features: Cantrips, Cyclic Spells, Overworld Advantage, and Ritual Magic. Every wizard can cast a handful of cantrips each day. You don’t have to memorize or choose them beforehand, you just cast them on the fly. Wizards can cast a number of cantrips equal to their Intelligence modifier each battle. Each cantrip takes a standard action to cast as a ranged spell. Outside of battle, a wizard can cast about three to six cantrips every five minutes. The Cantrip Mastery talent speeds up cantrip casting. At the adventurer tier (levels 1–4), cantrips with a standard duration last 10–60 minutes, plus 10 minutes per wizard level. The GM rolls and the wizard becomes aware that their cantrip is about to end a couple minutes before it’s done. At the champion tier, levels 5–7, most cantrips last 1–6 hours. At the epic tier, levels 8–10, cantrips last between 2–12 hours. For a list of available cantrips, see Cantrips. Spells that have a cyclic usage can always be cast at least once per battle, and are only expended in that battle if they are cast when the escalation die is 0 or odd. In other words, if you cast a cyclic spell like color spray or rebuke when the escalation die is even, the spell is not expended and can still be cast later in the battle. Wizardly magic taps into the power of the overworld. While a wizard is in the overworld, their daily spells become recharge 16+ after battle. Wizards can cast their spells as rituals. Champion Feat You can cast full rituals by using all your actions each round to focus on the ritual for 1d3 + 1 rounds. As with standard rituals, your fast rituals are not meant to replace combat spells; they’re a means of acquiring and improvising wondrous magical effects rather than a means of inflicting damage and conditions. Whenever you cast a daily wizard spell, you gain a +4 AC bonus until the end of your next turn. Adventurer Feat The bonus also applies to your Physical Defense. Champion Feat You gain 2d12 temporary hit points each time you cast a daily spell. Cantrips are at-will spells for you. Unlike normal wizards, who use a standard action to cast a cantrip, you can cast a cantrip as a quick action. To do something particularly cunning or surprising with one of your cantrips where the GM isn’t sure whether you could pull off that use of the spell, roll a normal save (11+) to cast the spell the way you envision it. Additionally, you can expend a 3rd level spell slot or higher to choose one cantrip per spell slot you have given up and create a once-per-day related effect with it that is much greater, if you and your GM can agree on a cool effect that suits the cantrip. Adventurer Feat You can use cantrip-style versions of any wizard spell you have memorized. When you expend a spell, however, you can’t make cantrip-style use of it any more. The key is that none of these uses should be combat relevant or deal damage. The Cantrip Mastery talent is more about enhance the roleplaying and less about combat usefulness. Once per battle, when you cast a spell that targets Physical Defense, before rolling for the number of targets or making the spell’s attack roll, you can expend your quick action to evoke the spell. Hit or miss, you’ll max out the spell’s damage dice (except on a natural one, which deals no damage to the target and likely damages the caster in some manner). Champion Feat Whenever you evoke a spell, you can reroll one of the attack rolls if that natural roll was less than or equal to the escalation die. You must take the new result. Trigger: A nearby creature you can see casts a spell. Target: The nearby creature casting a spell. Hit: The target’s spell is canceled, and the caster loses the action they were using for the spell. If the spell had a limited use, that use is expended if your natural attack roll is even. Champion Feat You can now cast counter-magic twice per battle. Epic Feat You can now cast counter-magic in reaction to a creature using any magical ability, not just casting a spell. Rename each of your daily and recharge spells. Think up the most over-the-top and extravagant names you can muster. Since these alternate spells are so lengthy, they take an additional quick action to cast. While the regular effects of the spells are the same as the more common versions, they have a small bonus effect appropriate to the situation. The bonus effect should suit the name of the spell or the way it’s delivered, and shouldn’t precisely match up with what the spell normally accomplishes. Your familiar is a tiny or small animal or creature that aids your magic and provides companionship. It also provides opportunities for improvisation between you and the GM. Your familiar is as intelligent as a normal person. It can communicate with you and will stay close you unless you’ve chosen abilities that let it roam. Your familiar is on your side but it’s not perfectly in your control. If your familiar dies, it can come back to you the next time you get a full heal-up. (The method or story used is between you and the GM.) Alternatively, you can get a new familiar. Familiars are useless in combat, except as indicated by their abilities. Ordinarily they aren’t damaged by enemy attacks and spells unless the story calls for it. Choose two of the following abilities for your familiar. You gain a +2 bonus to Dexterity skill checks. You gain a +2 bonus to Wisdom skill checks. Each battle, if your familiar is close to you, it bites the first enemy that hits you with a melee attack after that attack, dealing 1d4 damage per level (no attack roll) to that enemy. Your familiar flies as well as a hawk. It doesn’t fly that often and usually sticks with you, but it can do so when its other abilities allow. One battle per day, you gain the use of the racial power (without feats) of one nearby ally. Once per battle, when you hit an enemy engaged with you, you can add 5 ongoing poison damage per tier to the damage roll. Once per day, your familiar can separate itself from you and make a reconnaissance run of an area or location. Roll an easy skill check for the environment to get your familiar to scout unseen. You gain a +1 save bonus. Tough counts as two familiar abilities. Your familiar can talk like a person (but the GM speaks for the familiar more than you do). Your familiar gains another ability. Once per level, if your familiar is close to you, it can cast one of your spells as a free action on your initiative count, even if you have already expended the spell. The spell functions as if you had cast it. The cantrip creates a minor watch-sprite that can be instructed to scream if someone comes through an area or touches an object. Watch-sprites are notoriously stupid and sleepy, but with the right talking-to they might stay focused for the duration of the spell. At higher levels, the spell might summon little fanged spirits buzzing back and forth serving as both visual and actual deterrents. The cantrip creates a magical sigil on an object or person. These sigils are usually plain to see, though a deliberately invisible mark can be made. It takes a difficult perception or magic check to notice. This spell creates false noises emanating from somewhere nearby. The effect is like an exceptionally good version of throwing your voice, if your voice could create a wide variety of sounds. Attempted distractions with the cantrip are DC 15 challenges in adventurer environments, higher as you move into champion and epic environments. If someone is using ghost sound against the PCs, a Wisdom-based skill check can identify the sound as a magical fake. This cantrip summons a magical servitor three to four times as big as your closed fist that swarms around the door and attempts to punch or push it open (depending on whether you want to be quiet or announce your presence). Success is determined with an Intelligence check against the environment’s DC using an appropriate magical background. This cantrip does nothing to avoid any traps that might exist. This cantrip creates a fairly wide and consistent field of light, up to 30 feet in diameter, though it isn’t bright enough to dazzle. This cantrip creates a small telekinetic effect that lasts a round at most. At best it’s about half as strong as the wizard’s own strongest hand. At worst it’s half as strong as the wizard when they’re weak from a bad fever. This cantrip summons a variety of tiny (hand-sized and smaller) magical sprites who swarm over a chosen broken object attempting to mend it (over the course of 1–6 rounds). Small-scale repairs like torn wineskins, muddy clothing, a broken handgrip on a sword, and similar repairs that anyone could fix with two to four hours of devoted work gets handled in seconds. More elaborate repairs to complicated objects might require an Intelligence check, or at the GM’s discretion could only be possible if the wizard has taken the Cantrip Mastery talent. This cantrip produces magic tricks and small illusions. One casting usually gives you a minute of fun. The magic has nowhere near as much real world force as mage hand. This spell can put out nearby small fire sources such as campfire embers and candles, or smother a hem or sleeve someone has carelessly caught aflame. At higher levels, this cantrip can be used on smaller flames that are far away, or put out a large campfire or small bonfire nearby. This is a minor fire creation spell, enough to light a pipe, or a campfire, or even a page or two of an unprotected spellbook. It doesn’t work against living beings or against things that couldn’t easily be set on fire with a few seconds of steady application of a candle. The target of the spark has to be nearby and in sight. When you choose spells during a full heal-up, instead of taking a standard spell, you can choose to give up a spell slot to memorize the utility spell at the same level. When you take the utility spell, you gain access to a range of useful non-combat spells of the level you memorized it or below. You cast each utility spell at the level of the spell slot you gave up for it. You can give up multiple spell slots to take utility spell multiple times. Adventurer Feat Each utility spell you take lets you cast two spells from the available options instead of one. Champion Feat As above, but you can cast three utility spells instead of one. Effect: This spell provides you with an effective magical disguise that lasts about ten minutes, making the skill check to avoid unmasking one step easier: easy if it would have been a normal task, normal if it would have been a hard task, and hard if it would have been a ridiculously hard task. The spell only affects your general appearance, not your size. It can be used to hide your features behind the generic features of another person or race. Using it to impersonate a specific creature makes it less effective as a disguise (-2 to -5 penalty). 3rd level spell: The spell lasts for 1 hour. 5th level spell: The spell also provides smell; +2 bonus to any checks. 7th level spell: The spell also handles correct-sounding vocal patterns and rough mannerisms; +4 bonus to any checks. 9th level spell: You can now target an ally with the spell; you can also now use it on up to two creatures at once. Effect: When you cast this spell, it arrests your fall, letting you glide down the ground over a round or two. 3rd level spell: You can now target a nearby ally with the spell. 5th level spell: You can now target up to two nearby creatures with the spell. 7th level spell: You can now target up to five nearby creatures with the spell. 9th level spell: You gain some control over where a target falls, like a quickly gliding feather. Effect: You cast this spell on a door. For ten minutes, adventurer-tier creatures can’t get through the door. Champion-tier creatures can batter it down; each attempt requires a DC 20 Intelligence skill check (including an applicable background) by the caster to resist the battering and keep the spell going. Epic-tier creatures can walk right through. 3rd level spell: The spell now lasts for an hour. Adventurer-tier creatures are stymied. Champion-tier creatures can batter the door down or destroy it after three failed DC 20 skill checks by the spellcaster. Epic creatures notice that the now-busted door had magic on it. 5th level spell: Champion-tier creatures take a few minutes to force the door open. Epic creatures can force it open after one failed DC 25 skill check by the spellcaster. 7th level spell: Champion-tier creatures are stymied for up to an hour by the door. Epic tier creatures get through after three failed DC 25 skill checks by the spellcaster. 9th level spell: Champion-tier creatures can’t enter. Epic-tier creatures can’t get through for an hour. Effect: You create a glowing eyeball one inch in diameter made of raw arcane energy that can float up to a typical far-away distance from you in any direction (but no more than a city block’s distance or so). It works like a normal human eyeball and is dependant upon light to process images. Anything the eye can see, you can also. It moves at average walking speed for your species on your mental command—you can command it to stop, slow down, change direction, or return to you as desired. The eye persists for 1 minute per level; it has an AC and PD of 10 and is immediately destroyed if it takes any amount of damage. 5th level spell: The arcane eye can now see in total darkness. 7th level spell: The eye’s form is blurred and translucent, making it invisible to Champion-tier or lower creatures that can’t normally see invisible things. 9th level spell: The eye can see invisible creatures or objects within its line of sight. Effect: Until the end of the battle, you can use a move action to rise straight up into the air or descend straight down. The spell itself won’t move you horizontally. The up-or-down movement is about half as fast as your normal movement. While levitating, you take a –2 penalty to your attacks and are vulnerable to attacks against you. 5th level spell: You can now cast the spell on a nearby willing ally instead of yourself. 7th level spell: You can now cast the spell as a quick action, and the spell can now affect two targets. 9th level spell: The spell can now affect five targets. Effect: You send a one to two sentence message to another person you know and have touched in the last week. Sending a message to a person you can see is always easy. Sending a message to a person you can’t see requires a skill check using Intelligence against the highest-tier environment that you or the sender are occupying. The maximum distance you can send a message depends on the spell’s level. 3rd level spell: Across half a city, at most. 5th level spell: Across the entire city and a bit into the countryside. 7th level spell: Between cities near to each other. 9th level spell: From any city to any other city, or across a sea. Effect: Speak briefly, mind-to-mind, with a magic item you are touching that is owned by you or one of your allies. The item’s owner gets a free power recharge roll if that item’s power has been expended. 5th level spell: You no longer need to be touching the item; it only has to be nearby. 7th level spell: The item’s owner gains a +2 bonus to the item recharge roll. 9th level spell: If the item recharge roll fails, you keep this spell, but the item won’t talk to you until after your next full heal-up. Effect: Sometimes what you really need is a big slab of stone. You can create a stone wall 3 inches thick and smooth as polished marble out of thin air, plastering an area of up to about 100 square feet with the stuff. It lasts for an hour or until it’s broken down by an assailant. Mechanically, this can be used to cut off two nearby areas you are exploring (or fighting in) if there’s a gap or doorway to be filled. Adventurer tier creatures cannot break through or climb it, no matter how hard they try. Each round that a champion tier creature attempts to break through or climb over the wall requires the caster to resist with a DC 25 Intelligence check (applying a related background). A total of three failed checks means the wall is successfully breached. An epic tier creature can ram through or scale it faster than a champion tier one can—fail the check once, and they’re on you. 7th level spell: The skill DC to keep the wall up is now 20 instead of 25. 9th level spell: You now need to fail three Intelligence checks before Epic tier creatures can bust down or climb over your wall. Effect: You can breathe underwater for the rest of the battle (or about five minutes). You become aware a couple of rounds ahead of when the magic of the spell is about to end. 7th level spell: You and 1d4 + 2 nearby allies can breathe underwater this battle. 9th level spell: The spell affects you and 1d6 + 2 nearby allies for 4d6 hours. Effect: You can use this spell to get information you shouldn’t be able to get, peering in on other people’s lives for a short period of time, usually no more than ten minutes at a time. Some areas may be warded at the GM’s discretion. You must have touched the person you wish to spy on in the last month, or, at 9th level, within the last a year. Scrying as a single standard action won’t yield much. Concentrating on the spell for a while with props like a scrying pool or a crystal ball will work better. Miss: 5 ongoing acid damage, and you regain the spell during your next quick rest. 3rd level spell: 5d10 damage, and 10 ongoing damage; 10 ongoing on a miss. 5th level spell: 8d10 damage, and 15 ongoing damage; 15 ongoing on a miss. 7th level spell: 3d4 x 10 damage, and 25 ongoing damage; 25 ongoing on a miss. 9th level spell: 5d4 x 10 damage, and 40 ongoing damage; 40 ongoing on a miss. Effect: For the rest of the battle (or for five minutes), attacks against the target miss 20% of the time. 3rd level spell: The spell is now a quick action to cast. 5th level spell: Miss 25% of the time. 7th level spell: Miss 30% of the time, and you can now target 1d2 creatures with the spell. 9th level spell: Miss 30% of the time, and you can now target two creatures with the spell. Special: On a miss, the spell is not detectible by most others unless you miss by 4+ or roll a natural 1, in which case the target and its allies knows what you tried to do and will usually be angry about it. 3rd level spell: 4d6 damage, 20 hp or fewer. 5th level spell: 6d8 damage, 30 hp or fewer. 7th level spell: 10d6 damage, 40 hp or fewer. 9th level spell: 10d12 damage, 60 hp or fewer. Adventurer Feat Increase the hit point threshold of the weakened effect by 5 hp. Champion Feat On a miss, the spell deals damage equal to your level. Epic Feat The spell now targets 1d4 + 1 nearby enemies in a group. Attack: Intelligence + Level vs. the PD of the person holding the object or automatic success if the object is unattended. Effect: You either double or halve the size of the target object for your level in rounds (if used outside of combat, the effect lasts for your level in minutes instead). You can’t cause an item to expand or contract in a way that damages other objects or creatures, however—so, for instance, you can’t shrink a creature’s armor to crush it or make a door expand in its frame in order to break down a wall. If you shrink a creature’s shield, they lose its benefits; if you shrink their weapon, they take a penalty to damage equal to the escalation die + your level when attacking with it. Enlarging a shield, weapon, or similarly-sized held item requires the target’s holder to take a penalty to attack rolls equal to the escalation die + your level while still holding it. Either way, the creature has to make a save (11+) or drop the affected item when the spell is cast. 3rd level spell: All attack and damage penalties for holders of affected items worsen by 2. 5th level spell: Enlarging a held item causes the holder to become stuck (save ends) unless they drop it. Shrinking a held item causes the holder to lose a move action on their next turn out of sheer confusion. 7th level spell: You can target two items held by a single creature; all penalties to the holder stack. 9th level spell: You can now target items held by two different creatures, but no more than two items per creature. 3rd level spell: 2d8 damage. 5th level spell: 4d6 damage. 7th level spell: 6d6 damage. 9th level spell: 10d6 damage. Adventurer Feat You can choose two targets; roll half the damage dice for one missile and half the damage dice for the other, then assign one set of damage dice to each of the two targets. Epic Feat The 7th and 9th level versions of the spell now use d8s as damage dice. Effect: This spell creates 1d2 illusory doubles of yourself which remain close to you in a nearby group. On a natural odd hit from an enemy, one of the doubles took the hit instead of you—it winks out and disappears. 7th level spell: Whenever you suffer a crit, a double automatically takes the hit. 9th level spell: Add half of the current escalation die value to the number of doubles you create. Adventurer Feat This spell recharges on 16+ after battle if you have one illusory double left, or 11+ if you have two or more left. Champion Feat Your doubles may engage with nearby enemies. They can only make basic melee opportunity attacks identical to yours, which deal psychic damage. Epic Feat Your doubles explode in a dazzling display when struck, dealing psychic damage equal to your Intelligence modifier + your level + the current escalation die value. 3rd level spell: 4d8 damage. 5th level spell: 6d8 damage. 7th level spell: 7d10 damage. 9th level spell: 10d12 damage. Adventurer Feat When your ray of frost attack roll is a natural even hit, if the target is staggered after taking the damage, it is also dazed until the end of your next turn. Champion Feat The target of the spell can also be far away. Epic Feat When you cast the spell you can change the damage type to lightning or negative energy. Free action to cast, when an attack hits your AC. 3rd level spell: You gain a +2 AC bonus against the rerolled attack. 5th level spell: You can also use the spell against attacks that target your Physical Defense; replace references to AC with PD. 7th level spell: The bonus to AC/PD on the rerolled attack increases to +4. 9th level spell: The bonus to AC/PD on the rerolled attack increases to +6. Adventurer Feat You can now choose either of the attack rolls, in case the second one crits or is otherwise bad for you. Champion Feat Recharge roll after battle is now 6+. Epic Feat Hit or miss, you take only half damage from any attack you use shield against. 3rd level spell: 1d6 damage. 5th level spell: 2d6 damage. 7th level spell: 3d6 damage. 9th level spell: 4d6 damage. Adventurer Feat The spell now requires only a quick action to cast (once per round). Champion Feat Once per battle, when you hit the target of the spell, you can also daze it until the end of your next turn. Epic Feat The damage dice of the spell increase to d8s. Hit: The target is confused (save ends). Miss: If you miss all targets, you regain this spell during your next quick rest. 5th level spell: Target with 160 hp or fewer, and the target can be far away. 7th level spell: Target with 250 hp or fewer, or two targets each with 125 hp or fewer. 9th level spell: Target with 500 hp or fewer, or two targets each with 250 hp or fewer. Adventurer Feat On a miss against all targets with this spell, you can choose to daze those targets (save ends). If you do, you do not regain the spell. Champion Feat Each failed save against the spell deals 6d10 psychic damage to the target. Epic Feat The save against confused is now a difficult save (16+). Special: You can choose more than one target for this spell, but you take a –2 penalty when attacking two targets, a –3 penalty for three targets, and so on. Hit: 4d6 thunder damage, and the target pops free from you. 5th level spell: 4d12 damage. Special: The spell creates a number of force bolts equal to 1 + your Intelligence modifier. You must target a different creature with each bolt; any extras can’t be used. 5th level spell: 7d10 damage. 7th level spell: 10d12 damage. Champion Feat On a miss, a bolt now deals miss damage equal to your level. Epic Feat Increase the number of bolts by 1. Hit: The target cannot move or use move actions (hard save ends, 16+). 5th level spell: Target with 100 hp or fewer. 9th level spell: Target with 250 hp or fewer. Adventurer Feat If the spell misses all targets, you regain the spell during your next quick rest. Champion Feat The spell can target up to 2 nearby enemies whose total hit points don’t exceed the limit. Epic Feat Increase the limit by +50 hp. 5th level spell: 10d10 damage. 7th level spell: 2d8 x 10 damage. 9th level spell: 3d8 x 10 damage. Champion Feat A natural even hit also deals 10 ongoing lightning damage. Epic Feat A natural even hit now deals 20 ongoing lightning damage (hard save ends, 16+). Hit: The target is hampered (only makes basic attacks) until the end of your next turn. 5th level spell: Target with 160 hp or fewer. 7th level spell: Target with 266 hp or fewer. 9th level spell: Target with 400 hp or fewer. Adventurer Feat When you roll a natural even hit with the spell, you also deal psychic damage equal to double your level to the target. Champion Feat When you hit the target with the spell, you also daze it until the end of your next turn. Epic Feat When you roll a natural even miss against the target, you daze it until the end of your next turn. Target: Before making the attack, roll 3d20 + 45 to determine the maximum number of hit points of enemies you can target with the spell. The spell can affect multiple enemies. You must target nearby enemies with the current lowest hit points first, and you don’t get to choose the exact targets (except in the case of ties). If adding a creature would exceed the spell’s hit point maximum, that enemy can’t be a target. Hit: The target falls unconscious (hard save ends, 16+; it also ends if the target takes 10+ damage). 5th level spell: Targets 5d20 +50 max hp. 7th level spell: Targets 7d20 + 100 max hp. 9th level spell: Targets 9d20 + 200 max hp. Targets: 1d3 enemies in a nearby group. If you cast recklessly, you can target 1d3 additional enemies, but then your allies engaged with any of the targets may also take damage (see below). Hit: 4d8 cold damage; if you cast this spell recklessly, affected targets are also dazed (save ends). Reckless miss: Your allies engaged with the target take one-fourth damage and are dazed until they make an easy save (6+). 5th level spell: 8d6 damage and the spell can target PD or AC (your choice). 7th level spell: 9d12 damage. Adventurer Feat When casting recklessly, the save to avoid being dazed is now hard (16+) for enemies and normal (11+) for allies. Epic Feat Affected targets must make a normal save (11+) or be helpless until the start of their next turn. Always: For the rest of the battle, once per round when an enemy moves to engage you, you can make the following attack against it as a free action before it has the chance to attack in melee. Hit: Teleport the enemy somewhere nearby you can see. You can place them in combat with one of your allies, but you can’t place them in a dangerous location. (It’s a defensive tool). 5th level spell: The teleported enemy also takes 4d10 damage. 7th level spell: 6d10 damage. 9th level spell: 10d10 damage. Champion Feat When your teleport shield attack misses, the spell’s attack is not expended that round. Epic Feat You can now teleport the enemy somewhere far away that you can see; other restrictions still apply. Hit: The target is dazed for a number of rounds equal to the escalation die; a normal save (11+) ends the condition. On an attack roll of natural 16+, the target is also stuck until the end of your next turn. Natural Even Miss: The target is dazed until the end of its next turn. 5th level spell: On any miss, the target is dazed until the end of its next turn. 7th level spell: On an attack roll of natural 12+, the target is also stuck until the end of your next turn. 9th level spell: You can target far-away enemies with this spell, and you suffer no penalty for targeting up to 3 enemies (targeting 4 or more enemies incurs all penalties as normal, however). Adventurer Feat The dazed effect ends only on a hard save (16+). Champion Feat You summon a swarm of spiders into the webbing, which deal 4d10 poison damage to anyone stuck in the web at the start of their turn. Hit: 7d10 acid damage, and the target becomes vulnerable (18+) for a number of rounds equal to the current escalation die value. 9th level spell: 3d4 x 10 damage. Champion Feat Affected targets instead become vulnerable (16+). Epic Feat Increase the number of targets to 1d4 + 1 instead of 1d4. Hit: 9d10 psychic damage, and the target is hampered until the end of your next turn. 7th level spell: 3d4 x 10 damage. Champion Feat When you roll a natural even miss with the spell, the target is also hampered until the end of your next turn. Epic Feat Increase the number of targets to 1d4 + 1. Effect: You teleport somewhere nearby that you can see. 7th level spell: Your destination can now be far away, but not so far that it is out of range of enemy attacks that can hit far away targets. 9th level spell: You can take one ally who is next to you along with you as you teleport. Miss: You regain this spell during your next quick rest. Effect: The target creature’s size is either doubled or halved (your choice), including all items it is wearing or holding. The effect lasts for a number of rounds equal to your Intelligence modifier + the current value of the escalation die. An enlarged creature gains one quarter of its current hit points on top of its current total and decreases its AC by 1 and its PD by 3. Its weapon attacks deal 1.5 times the normal damage—this doesn’t affect damage from spells, but does increase damage from natural abilities like breath weapons or claws. A shrunken creature loses one quarter of its current hit points from its current total, and increases its AC by 1 and its PD by 3. Its weapon attacks deal half the normal damage—again, this doesn’t affect damage from spells, but does decrease damage from natural abilities like breath weapons or claws. When the spell wears off, any hit points gained from being enlarged are lost, although the affected creature can’t be brought to less than1 hp due to this. Any hit points lost from being shrunken return fully when the spell wears off. 7th level spell: Enlarged creatures gain a bonus to weapon attack rolls equal to the current escalation die value when cast. Shrunken creatures suffer a penalty to weapon attack rolls equal to the current escalation die value when cast. 9th level spell: You can target two creatures with this spell. Effect: Until the end of the battle (or for five minutes out of combat), the target becomes invisible until it attacks or uses some ridiculously flashy action. High Arcana: The duration out of combat is 1 hour instead. 7th level spell: You can now target 1d3 nearby allies (including you) with the spell. 9th level spell: Creatures made invisible by the spell have a 25% chance of remaining invisible the first time (and first time only) they attack or get flashy. Hit: 8d12 damage and the target is stuck (save ends) for a number of rounds equal to your level. 7th level spell: 12d10 damage. Champion Feat Affected targets must make a hard save (16+) to end the stuck condition. Epic Feat Choose one target you hit with this spell. The titan’s fist flings them to a far-away location of your choice in the immediate encounter area. Effect: For the rest of the battle (or for five minutes), the target gains resist damage 16+. Enemies who can see invisible creatures ignore this resistance. Whenever the target uses a move action, there is a 50% chance that it can teleport somewhere nearby instead of physically moving. 9th level spell: 75% chance. Effect: The target can fly until the end of the battle (or for five minutes). Your speed doesn’t increase appreciably but you can move in three-dimensions. 9th level spell: When you cast the spell, you can choose one: the effect lasts for an hour OR you can target 1d4 + 1 creatures for the normal duration. Effect: On the target’s next turn (not this one, if you cast it on yourself), the target gains an additional standard action. In addition, at the start of each of the target’s turns this battle, if the escalation die is even, roll a d20 and add the escalation die; on a 16+, the target gains an additional standard action that turn. 9th level spell: The roll for additional standard actions is now 11+ instead of 16+. Hit: The target turns visible and cannot become invisible again this battle. Miss: If there are one or more invisible creatures nearby, you become aware of their presence. Not where they are, or who they are, but that there are invisible creatures present. 9th level spell: The spell also affects far away targets that you could normally see. Effect: Until the end of the battle, the target ignores the resistance power of any creature it targets with an attack. 9th level spell: You can now target 1d4 nearby allies with the spell. Target: 1d3 + 1 nearby enemies in a group. If you cast recklessly, you can target 1d2 additional enemies, but then your allies engaged with any of the targets may also take damage (see below). Hit: 2d4 x 10 damage. 9th level spell: 2d8 x 10 damage, and gravity remains reversed for any hit targets (as well as any damaged allies on a reckless miss) for a number of rounds equal to the current escalation die value when you cast the spell. If there’s no ceiling in the place where you cast this, multiply the base damage by the number f rounds the effect lasts—that’s how much they’ll take when they finally land. Hit: On the target’s next turn, it can only take either a standard action or a move action, but not both. In addition, at the start of each of the target’s turns this battle, if the escalation die is odd, roll a d20 and add the escalation die; on a 16+, this effect persists for that turn. 9th level spell: The roll to repeat the effect is now 11+ instead of 16+. Special: You or an ally you are next to must be suffering from a condition caused by an enemy for you to cast this spell. Hit: 2d6 x 10 psychic damage, and you can transfer one condition caused by your enemies from you or the ally you are next to over to the target. If timing is required, interpret the transferred condition as if you had caused it with this spell. 9th level spell: 2d10 x 10 damage; if the spell misses, you regain it during your next quick rest. Hit: 4d8 x 10 damage, and the target is vulnerable (hard save ends, 16+). In addition, if the target drops to 0 hp from this attack, or drops to 0 hp before it saves against the vulnerable effect of this attack, it is gone, dusted, nothing remaining. Epic Feat You can now target a far away creature with the spell. Special: You summon a meteor swarm. If you’re underground, you get the ur-dark stalactite equivalent! Nothing more happens this round, but roll 1d3 + 1 to determine how many meteors you have summoned. At the start of your next turn, even if you are unconscious or dead or have left the area, the meteors arrive one per turn at the start of each of your turns and slam into the combat area. Target: You can make an attack with each meteor against 1d4 enemies in a group. Alternatively, use the spell to level an area with high impact property damage. Hit: 4d4 x 10 damage of the energy type of your choice (cold, fire, lightning). Any allies engaged with the enemies you are targeting take one-fourth damage from each meteor that impacts the area. Epic Feat Each meteor now deals 5d4 x 10 damage. Effect: You create a series of stationary multicolored barriers around you that grant you resist 18+ to all damage, even from weapons (but not from holy or negative energy). You can leave or re-enter the barriers without harming yourself, but other creatures who pass them suffer 4d20 points of a certain damage type as indicated on the chart below. The rainbow barriers can be overcome only by physically passing through them, or by dealing 40 points of a certain damage type to each one in the specific order presented below. Attack rolls that target a barrier must overcome your PD (even if they would normally target AC or MD), and the resistances don’t apply to the barriers—only to you. As each barrier comes down, you lose the indicated resistance type; you also lose your resistance to weapon damage when the final violet barrier is dispersed. Epic Feat You can expand the barriers to hold 1d2 allies who can enter and exit them just as you can. Any adventurer or champion tier monsters who pass through a barrier must make a hard save (16+) or be hampered and dazed until the end of their next turn. Effect: You and up to 4 allies next to you can teleport to any location in the world, underworld, or overworld that you have previously visited. When you teleport, roll a d20. If you roll a 1, you miss your desired location and arrive somewhere else altogether. Otherwise, you and your allies arrive at the desired location at the start of your next turn. Any effects of spells or items cast before teleporting are dispelled and no longer function on arrival. Epic Feat Your allies don’t need to be next to you before you cast the spell, just nearby. Alternately, if they are all next to you when you cast the spell, you can teleport to a location known to one of your allies.